Prime minister David Cameron offers a ‘profound’ apology to the victims of the 96 Hillsborough victims as a new independent report is published. THE REPORT of an independent panel into the events at Hillsborough stadium in Sheffield, which resulted in the deaths of 96 Liverpool fans in April 1989, has revealed that police sources actively misled the media on the causes of the disaster in order to deflect criticism from themselves. The report, distributed to the families of the victims this morning and released publicly this afternoon, reveals that police amended the statements given by 164 witnesses to the disaster, the worst sporting tragedy in British history. In 116 cases, the statements were doctored to explicitly remove comments which criticised the policing operation at the game – an FA Cup semi-final between Liverpool and Nottingham Forest – in coordinated efforts by South Yorkshire police to spread a false narrative about the events. The report – based on over 400,000 pages of previously undisclosed papers detailing the actions of police, paramedics and officials – also found that law enforcement authorities searched national police databases for details of the dead, seemingly looking to find evidence of previous civil wrongdoing. 94 fans were killed in the human crush at Sheffield Wednesday’s ground when a bottleneck at the stadium turnstiles as the game approached resulted in chronic overcrowding in the Leppings Lane end housing the Liverpool supporters. A further two fans died in the following days and years. A coroner took blood samples from all the deceased, including children, and found what prime minister David Cameron described as “no rationale whatsoever” for the police attempts to link the disaster to excessive alcohol consumption and the late arrival of Liverpool fans at the ground’s Leppings Lane end. Cameron said some police had briefed a Sheffield news agency, which in turn reported to national media, that drunkenness and violence among Liverpool fans had contributed to the violence – with The Sun in particular reporting that some fans had urinated on, and stolen belongings from, the bodies of dead fans. Victims’ advocates have long insisted that mistakes by police directly contributed to the stadium deaths and that other errors by emergency workers meant some of the injured were denied medical treatment. A local inquest into the deaths in 1991 returned verdicts of accidental death, but today’s report criticised the coroner for refusing to accept evidence dating from after 3:15pm on the day of the disaster. The report said this resulted in the coroner disallowing critical evidence from pathologists, which may have averted its eventual findings. “The attempt of the inquest to draw a link between blood alcohol and late arrival was fundamentally flawed,” Cameron told MPs, adding that the level of alcohol consumption among supporters “was unremarkable and not exceptional for a social or leisure occasion”. “It’s clear to me that the new evidence in today’s report raises vital questions which must be examined,” the prime minister added, saying it was now up to the office of Britain’s attorney general to decide whether the original inquest should be quashed and a new one sought. With the weight of the new evidence in the new report, it is right for me to make a proper apology to the families of the 96 for all they have suffered over the past 23 years. So on behalf of the government, and indeed our country, I am profoundly sorry that this double injustice has been left uncorrected for so long. Cameron said the report was “black and white” in concluding that the behaviour of Liverpool supporters was “not the cause of the disaster”, and had found “no evidence in support of allegations of exceptional levels of drunkenness, ticketlessness or violence among Liverpool fans”. “This is what the families and the fans have been fighting for 23 years. Without the truth, you cannot grieve and where there is deceit, you get no justice,” said Margaret Aspinall, whose 18-year-old son James was among the victims. 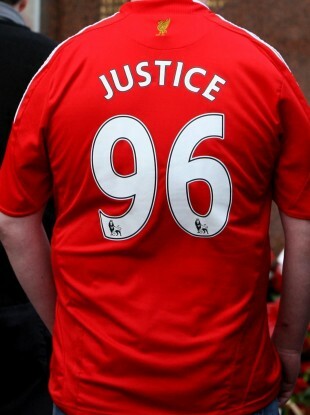 Email “Independent report finds police changed Hillsborough statements to deflect blame”. Feedback on “Independent report finds police changed Hillsborough statements to deflect blame”.